I’m a hypocrite. I speak one way, but sometimes my actions show otherwise. I sometimes get angry, irritable, sad, depressed, lustful, hateful, spiteful, loveless, joyless, and just all around honorary. I’m a hypocrite. There, I admitted it! If you are looking for me to be your excuse for living a lifestyle contrary to what you know to be right, then print this page and keep it as your hall pass. What about me? I’m headed to church with the other hypocrites so that I can learn how to receive the healing that I so greatly desire. I’m headed to church so that I can join in with my fellow brothers and sisters as we give thanks and praise to the One who is teaching us how to deny ungodliness and worldly lusts (Titus 2:11). If you would like to join us, you are more than welcome. Don’t worry, we won’t tell anyone you are a hypocrite. It will be our little secret. 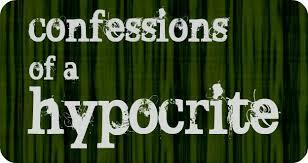 Yes, the church is full of hypocrites, and I am one, too! Thank God for Jesus’ healing love! Amen! Welcome my fellow hypocrite!